This Society was formed over 20 years ago and now there is a regular programme of winter meetings and organised walks during the summer months. Currently meetings are held in the Small Hall of the Parish Hall; the numbers attending are increasing in size, currently around 50 to each meeting. However new members are very welcome. If interested, please just come to a meeting or email history@rowlandscastle.com. 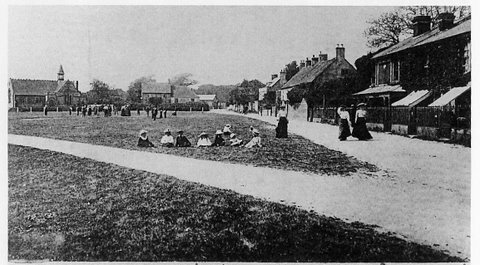 There was interest in village history before the Society was formed. Charles Cotton, a celebrated Victorian watercolourist, wrote contemporary comments in the 1860’s to accompany his paintings. In 1929, a history was published under the authorship of “EJW” who was believed to be a Mr Waddeson from Finchdean Road. Also, “Innominate” wrote on historical matters in the Hampshire Telegraph in the 1930’s and he may have been the Percy Elliott who wrote articles in local newspapers in the 1950’s. F.O’B.Adams was the Village Postmaster in the 1950’s and an avid collector of Village history who found and preserved many original items. He also pioneered the recording of memories and taped villagers reminiscing about events as far back as 1877. Jack Barrett wrote articles about his youth in the Village during the 1930’s which have proved invaluable documents of that period. Histories of the Village have been included as part of Royal celebrations in 1935, 1937, 1953 and 1977. Formal histories were published in the 1960’s by CC Stanley and June Williamson. Other driving forces were Clifford Miles and now Ted Redsull (whose Fayre Day exhibitions are a delight). (Kind acknowledgements to Paul Marshman, long-time Historian of Rowlands Castle, and in particular his article “Preserving the Past” in the Rowlands Castle Association Village Magazine Spring 2010). Sonya Teale (92412675) records the recollections of the residents of Rowlands Castle. The sessions are informal and give her much pleasure. Volunteers for interview are most welcome. She has completed 27 interviews to date, the oldest interviewee being Doris Hurn aged 100 years. The original tape is retained by Hampshire Record Office in Winchester for the purpose of study and research. A copy is returned to Rowlands Castle Historical Society for their collection of items of local interests.